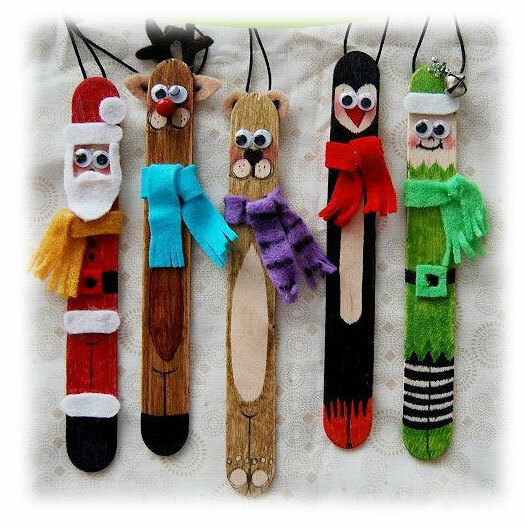 December Newsletter: Christmas at Shear Madness! Toys for Tots at Shear Madness! 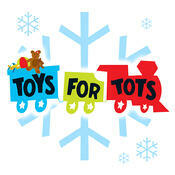 Your local Shear Madness Haircuts for Kids is now collecting Toys for Tots donations. The mission of the Toys for Tots Program is to collect new, unwrapped toys, and distribute them as Christmas gifts to less fortunate children in the community. Hurry! The DEADLINE for toy collections is December 11! Want more information? Click here for a list of locations and contact info. Great Christmas Coupons: Tis the season for giving, and if you're into saving a little cash on that must-have item you’ve been wanting to buy as a gift, you'll want to check out our coupon page. For example, this month we have 20% off any Hair Styling Product! And if you've had your eye on one of our adorable plush items, right now we also have 20% off any Plush item retailing over $20! WOW! December News at Shear Madness! ShEAR Dazzled at Shear Madness! We are really excited that we're NOW offering Ear Piercing at participating locations! Our Ear Piercing is a great experience! We don't just pierce the ears - we make it SPECIAL with Spa Robes, a keepsake plush animal, and more! It can even be combined with a Diva Day! To find out more, please click our ShEAR Dazzled page! Groovy Glamour Winter Break FUN Classes Begin! Would you like to learn more on how to braid hair, and care for and paint your nails in cool ways? 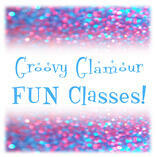 If so, our Groovy Glamour Winter Break Fun classes (at participating locations) might be just the thing! To find out more details on the Groovy Glamour Winter Break Fun Classes, click here for a list of locations and contact information! Tis the Season on Social Media! To our many awesome followers on Facebook, we'd like to say a special THANK YOU to each of you for helping us share the fun with Free Haircut Friday events, madtastic announcements, kids jokes and more. You all are GREAT! And if you want more Shear Madness fun, why not check out our Franchise Blog, Instagram, Google+, Twitter, and our favorites pins on Pinterest! A Gift that can Keep on Giving! 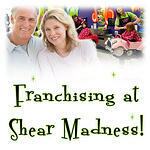 Are you or someone you know interested in opening a Shear Madness? Well, now is the time to find out more information. Check out the many helpful resources on our franchise website by clicking: Franchise Opportunities. And if you're interested in our other free resources for businesses, or would like to learn more about how to become a successful owner of your own franchise business, check out our blog or call 1-888-98 GONE MAD! Make a Christmas Memory! Christmas is such a fun and special time for kids and adults alike, as it's that time of year when families come together to celebrate and spend time together. So don't miss our Crafts for Kids section on Pinterest, and spend an hour or two with the kids making a special Christmas memory! Learn how to make popsickle stick Christmas ornaments, a cute Christmas village out of cardboard tubes, 3D paper snowflakes, a funny paper plate reindeer, clothespin angels, "stained glass" window ornaments, and fingerpaint Christmas lights! We also found a great coloring sheet that kids are sure to enjoy too! Have fun! At Shear Madness, Every Child Matters!